"Burr oak" redirects here. For places named after the oak, see Burr Oak. Quercus macrocarpa var. abbreviata A.DC. Quercus macrocarpa f. appressa Trel. Quercus macrocarpa var. minor A.DC. Quercus macrocarpa f. oliviformis (F.Michx.) Trel. Quercus macrocarpa f. orbiculata Trel. Quercus macrocarpa is widespread in the Atlantic coastal plain from New Brunswick to North Carolina, west as far as Alberta, eastern Montana, Wyoming, and northeastern New Mexico. The vast majority of the populations are found in the eastern Great Plains, the Mississippi–Missouri–Ohio Valley, and the Great Lakes region. Quercus macrocarpa is a large deciduous tree growing up to 98 ft (30 m), rarely 160 ft (50 m), in height, and is one of the most massive oaks with a trunk diameter of up to 10 ft (3 m); reports of taller trees occur, but have not been verified. It is one of the slowest-growing oaks, with a growth rate of 1 ft (30 cm) per year when young. However, other sources state that a bur oak tree that is planted in the ground grows up to 3 ft (91 cm) per year. A 20-year-old tree will be about 20 ft (6 m) tall if grown in full sun. Naturally occurring saplings in forests will typically be older. Bur oaks commonly get to be 200 to 300 years old, and may live up to 400 years. The bark is a medium gray and somewhat rugged. The leaves are 2 3⁄4–6 in (7–15 cm) long and 2–5 in (5–13 cm) broad, variable in shape, with a lobed margin. Most often, the basal two-thirds is narrower and deeply lobed, while the apical third is wider and has shallow lobes or large teeth. The flowers are greenish-yellow catkins, produced in the spring. The acorns are very large, 1–2 in (2.5–5 cm) long and 3⁄4–1 1⁄2 in (2–4 cm) broad, having a large cup that wraps much of the way around the nut, with large overlapping scales and often a fringe at the edge of the cup. Bur oak is sometimes confused with overcup oak and white oak, both of which it occasionally hybridizes with. The acorns are the largest of any North American oak (thus the species name macrocarpa, from Ancient Greek μακρός makrós "large" and καρπός karpós "fruit"), and are an important wildlife food; American black bears sometimes tear off branches to get them. However, heavy nut crops are borne only every few years. In this evolutionary strategy, known as masting, the large seed crop every few years overwhelms the ability of seed predators to eat the acorns, thus ensuring the survival of some seeds. Other wildlife, such as deer and porcupine, eat the leaves, twigs and bark. Cattle are heavy browsers in some areas. The bur oak is the only known foodplant of Bucculatrix recognita caterpillars. Bur oaks primarily grow in a temperate climate, in regions such as (Wisconsin, Minnesota, Illinois, Indiana, Iowa, etc), where their tree rings are read as one year of growth. This is because the trees grow more in warm wet climates and less in cold dry climates. So, when the season changes so does the amount the tree ring will grow for that year. 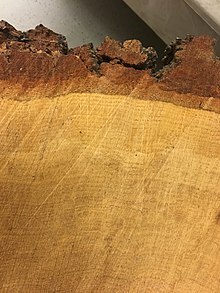 The woody part of the tree that presents the rings is made up of xylem. The xylem is darker when it is more packed together. This occurs in colder and dryer weather. The lighter part of the ring occurs during an ample growth period which includes warm and more wet weather. Bur oak typically grows in the open, away from forest canopy. For this reason, it is an important tree on the eastern prairies, often found near waterways in otherwise more forested areas, where there is a break in the canopy. It is drought resistant, possibly because of its long taproot. At the end of the growing season, a one-year sapling may have a taproot 1.37 m (4 ft 6 in) deep and a lateral root spread of 76 cm (2 ft 6 in). The West Virginia state champion bur oak has a trunk diameter of almost 3 m (10 ft). Large bur oaks, older than 12 years, are fire-tolerant because of their thick bark. One of the bur oak's most common habitats, especially in Midwestern United States, is the oak savanna, where fires often occurred in early spring or late fall, especially in hill country. Without fires, bur oak is often succeeded by other tree and shrub species that are more shade-tolerant. Older bur oaks may survive in dense woodlands for 80 years, until they are weakened by wood-rot fungi in the lower branches killed by shade, and by 100 to 110 years, they are often snapped by wind storms. Quercus macrocarpa is cultivated by plant nurseries for use in gardens, in parks, and on urban sidewalks. Bur oak makes an outstanding ornamental tree. Among the white oaks, it is one of the most tolerant of urban conditions, and is one of the fastest-growing of the group. It has been planted in many climates, ranging northwards to Anchorage, Alaska, and as far south as Mission, Texas. It withstands chinook conditions in Calgary, Alberta. The name sometimes is spelled "burr oak", as for example in Burr Oak State Park in Ohio, the cities of Burr Oak, Iowa and Burr Oak, Kansas, the village of Burr Oak, Michigan, and in the title Burr Oaks by poet Richard Eberhart. Bur oak blight, a fungal disease affecting bur oak trees. ^ Kenny, L.; Wenzell, K. (2015). "Quercus macrocarpa". IUCN Red List of Threatened Species. IUCN. 2015: e.T33991A2839807. doi:10.2305/IUCN.UK.2015-4.RLTS.T33991A2839807.en. Retrieved 12 November 2016. ^ "Quercus macrocarpa". World Checklist of Selected Plant Families (WCSP). Royal Botanic Gardens, Kew – via The Plant List. ^ "Quercus macrocarpa". County-level distribution map from the North American Plant Atlas (NAPA). 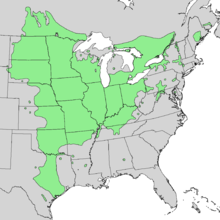 Biota of North America Program (BONAP). 2014. ^ a b c Nixon, Kevin C. (1997). "Quercus macrocarpa". In Flora of North America Editorial Committee (ed.). Flora of North America North of Mexico (FNA). 3. New York and Oxford – via eFloras.org, Missouri Botanical Garden, St. Louis, MO & Harvard University Herbaria, Cambridge, MA. ^ Spengler, Teo. "How to Plant Bur Oak Trees". SFGATE. ^ "Bur Oak – Could it be our best fast-growing shade tree?". Wylie, Texas: Arborilogical Services, Inc. 3 November 2010. ^ "Quercus macrocarpa". Eastern OLDLIST. Rocky Mountain Tree-Ring Research, Inc. and Eastern Kentucky University. 2010. ^ Ward, James (2 June 2005). "TEMPERATE DECIDUOUS FOREST BIOME". Temperate Deciduous Forest Biome. ^ Rathgeber, Cyrille B. K. (2016). "Biological Basis of Tree-Ring Formation: A Crash Course". Frontiers in Plant Science. 7. doi:10.3389/fpls.2016.00734. PMC 4880555. ^ a b Johnson, Paul S. (1990). "Quercus macrocarpa". In Burns, Russell M.; Honkala, Barbara H. (eds.). Hardwoods. Silvics of North America. Washington, D.C.: United States Forest Service (USFS), United States Department of Agriculture (USDA). 2 – via Southern Research Station (www.srs.fs.fed.us). ^ a b Gucker, Corey L. (2011). "Quercus macrocarpa". Fire Effects Information System (FEIS). US Department of Agriculture (USDA), Forest Service (USFS), Rocky Mountain Research Station, Fire Sciences Laboratory – via https://www.feis-crs.org/feis/. ^ "Richard Eberhart". Poetry Foundation. Bibliography: Poetry Foundation. Retrieved 2 February 2017. Burr Oaks, Oxford University Press (New York, NY), 1947.